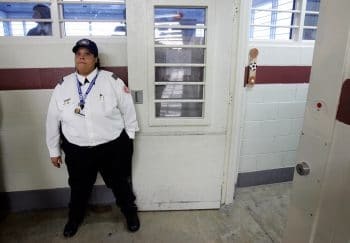 In our previous report on the U.S. immigration enforcement regime, MintPress News looked at how the for-profit prison industry and anti-immigrant lobbyists have driven the U.S. government’s war on immigrants. In this report, we look at the factors that fueled the monstrous growth of the migrant incarceration system and concentration camp network sprawling across the United States. 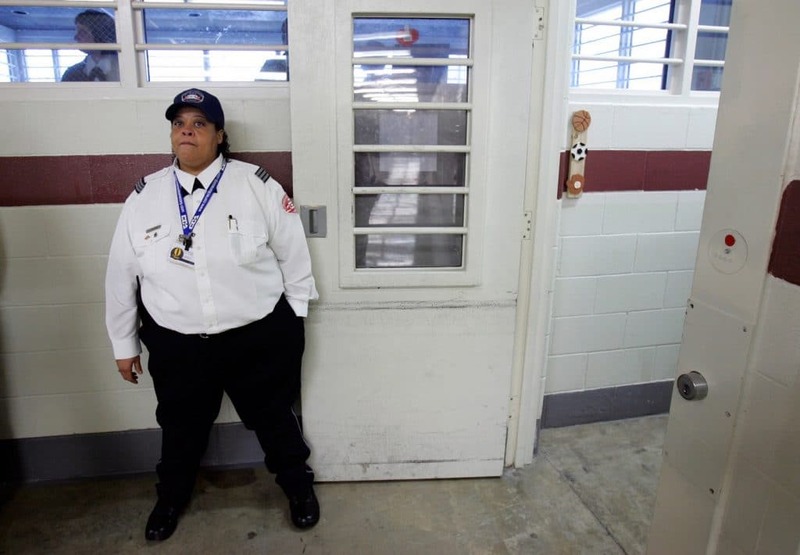 A guard holds open a door during a media tour of the T. Don Hutto Residential Center in Taylor, Texas, Friday, Feb. 9, 2007. LM Otero | AP. Immigration-related U.S. concentration camps come in different varieties, each with its own preferred euphemisms: there are detention centers for adults, childcare facilities for young children ripped from their families; and for those incarcerated migrant adults (usually women) fortunate enough to remain with their children, there are Family Residential Centers – a cheerful term that makes it sound as if families are enjoying a therapeutic retreat at Club Med rather than facing incarceration. Even toddlers under the age of five have been placed in three so-called “tender age shelters” located in Texas, with a fourth compound planned for Houston at a former warehouse slated to be repurposed into a “permanent unaccompanied alien children program facility.” During the Second World War, the government vocabulary was riddled with similarly clean, bureaucratic euphemisms that obscured the persecution of a community seen as a hostile and inherently “alien” minority: Japanese immigrants and Japanese-descended citizens of the U.S.
Children at the Weill public school in San Francisco recite the Pledge of Allegiance. 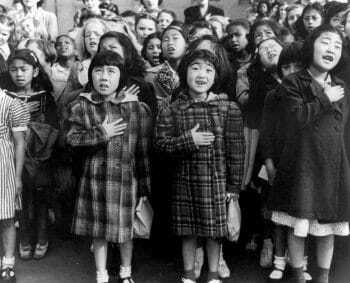 Some of them are evacuees of Japanese ancestry who will be housed in War Relocation Authority centers for the duration of World War II, April 1942. Dorothea Lange | U.S. War Relocation Authority via AP. 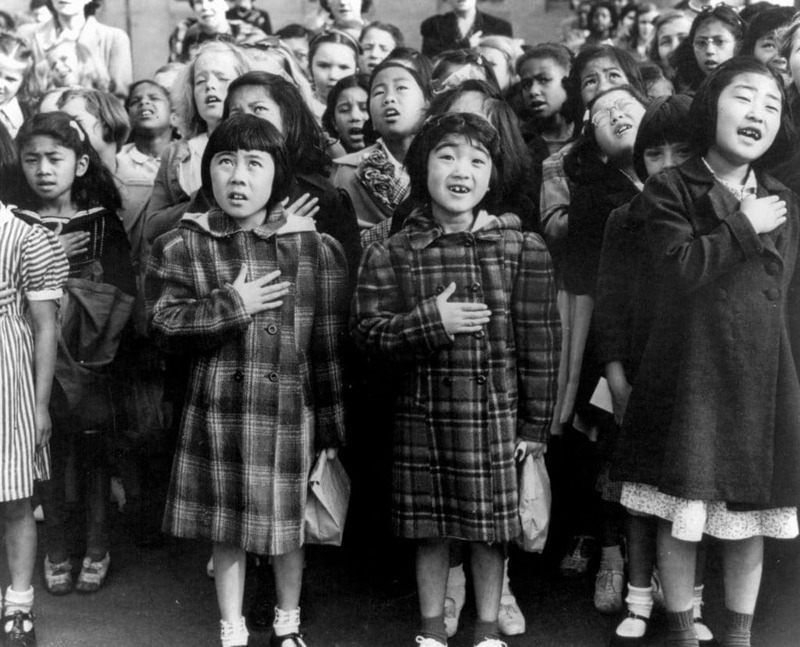 Japanese immigrants and Japanese Americans were detained and placed in assembly centers (temporary detention centers) and relocation centers, which were at the time depicted as akin to“summer camps.” In reality, these were concentration camps in the middle of harsh desert climates, which were surrounded by guard towers and barbed-wire fences, where Japanese-descended prisoners were overseen and routinely abused by U.S. Army personnel equipped with machine guns and even tanks. 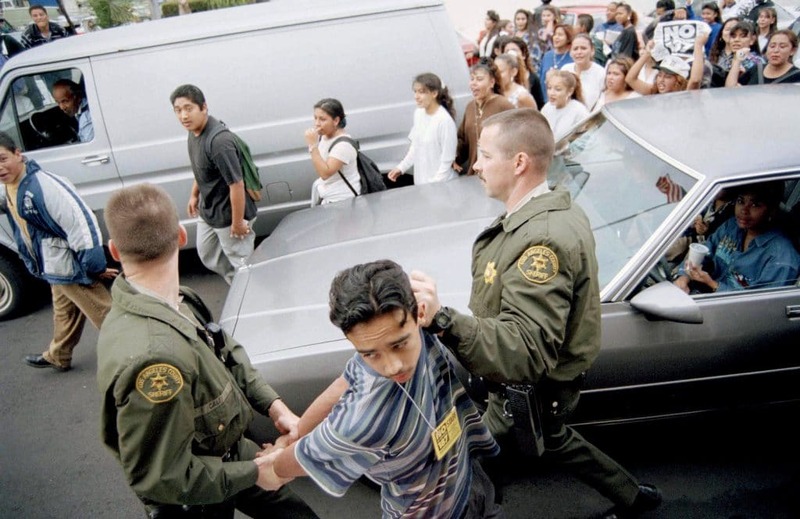 Los Angeles County Sheriff’s deputies hold a young protester during a rally by students against Proposition 187, Nov. 2, 1994. Dana Fisher | AP. U.S. financial and political intervention in the national life of Mexico during the 1980s and 1990s, often carried out through the WTO, has pauperized the Mexican working class. It is they who have had to suffer the brunt of the mandatory austerity programs, strict debt restructuring, and privatization initiatives that were imposed on Mexico in the 1980s after the credit binge of the Mexican bourgeoisie during the previous decade. The U.S. responded to the nativist clamor by militarizing the U.S. border — resulting in the deaths of thousands of border-crossers who died in the harsh frontier climate — and by conducting showy Border Patrol operations and raids such as 1993’s Hold the Line in San Diego and 1995’s Operation Gatekeeper in El Paso, which did little to stem the flow of migrants. However, the generally lax open border policy provided employers and corporations with access to a huge pool of cheap labor to tap into, handsomely benefiting a then-booming U.S. economy. By 2005, about 12 million undocumented migrants — over half of whom were Mexican — resided in the United States. The 2006 implementation of the U.S.-Central America Free Trade Agreement (CAFTA, now CAFTA-DR) had a similarly negative impact on development in Costa Rica, the Dominican Republic, El Salvador, Guatemala, Honduras, and Nicaragua, whose governments all signed. Rural migrants were displaced and found no employment in cities, fueling the growth of organized crime and acting as a sharp push factor for migration to Mexico and the United States. Subsequent administrations’ security agreements with right-wing governments and imperialist meddling — such as the Obama-Clinton State Department’s success in overthrowing left-populist Honduran President Manuel Zelaya in June 2009 — further exacerbated the instability and misery plaguing Central America, creating an inexorable current that continues to drive tens of thousands of desperate migrants to the doorstep of the southern U.S. border in their life-or-death bid for asylum. 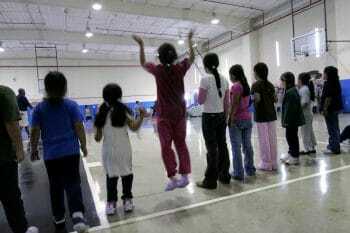 Children participate in physical education at the T. Don Hutto Residential Center in Taylor, Texas, during a tour for the media, April 22, 2008. Donna McWilliam | AP. Demonstrators block an intersection outside of the Immigration and Customs Enforcement offices, Feb. 28, 2018, in San Francisco. Marcio Jose Sanchez | AP. And on Wednesday — lost in the fanfare of his family-separation feint — Trump issued an executive order extending the ability of ICE to incarcerate unauthorized migrants from 20 days to an indefinite period. The United States government has long maintained the largest and most technologically advanced system of mass confinement in human history. 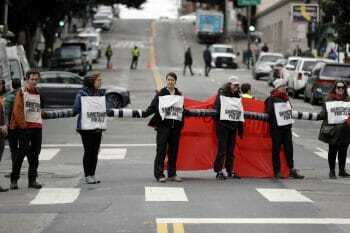 Over time, a growing component of this system has consisted of new migrant concentration camps. It’s about time that we recognize what led the U.S. to this point and where that path may lead from here. Even the most superficial reading of history reveals how in times of crisis, legal rights taken for granted as permanent or foundational vanish like a puff of smoke when security threats and a push to restore “law and order” casts a dragnet into civilian populations. As history teaches us, threats to the nation — both external and internal — can suddenly or gradually change. Today’s flash-in-the-pan monster at our door might be migrant “animals” from Latin America, but tomorrow it may take the form of anyone or any group who threatens or disrupts social order — be it a religious group, a national minority, the swelling homeless population, the politically non-compliant or any other class of people criminalized by a government that exclusively caters to the needs of capital. 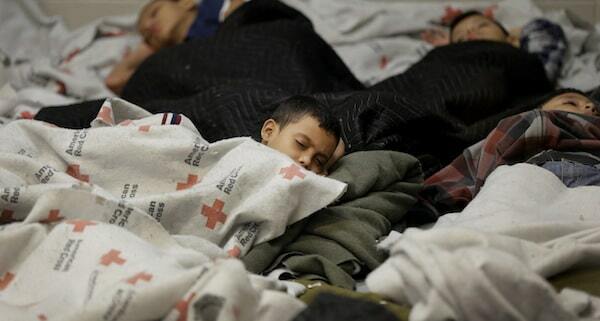 Top Photo | Child detainees sleep in a holding cell at a U.S. Customs and Border Protection processing facility, on June 18, 2014, in Brownsville,Texas. Photo | AP.